I finished cocktails today. 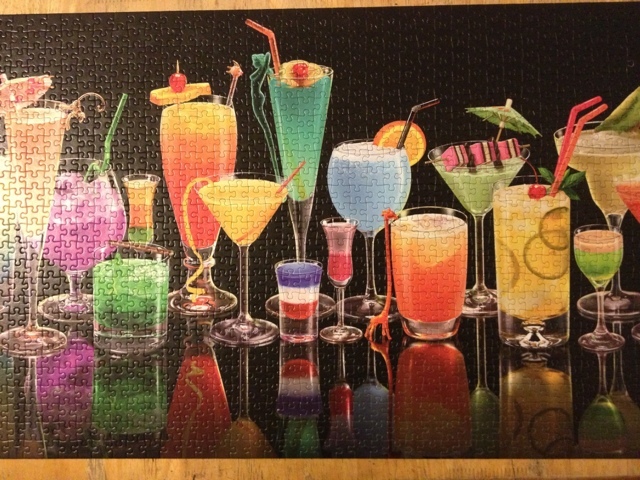 The girls completed the drinks while I did the border and the solid black pieces. It took me three times longer to do black than it took them to do the entire rest of the puzzle. It was super frustrating and prone to fitting pieces that dont belong. On several occasions I had to back track and pull up a series of black piece that fit their neighbors and try again after brute forcing (trying every piece) yielded no results in a fit. This is not fun puzzling in my opinion. With this puzzle, we are starting our new mounting technique. We have put contact paper on the back and we are waiting to get foam board to glue it to. We need to borrow a truck or get a taxi in order to get the sheets home. I dont like the method of nailing between the pieces to attach a puzzle to the wall. You would not nail a painting you just finished to the wall, and neither will I nail another puzzle.